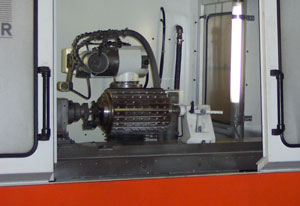 Our fleet of precision CNC grinders can accommodate even the largest Pelletizer Rotors. Our knowledgeable staff will grind your parts quickly so you can keep your machines running at optimal capacity. All rotors are given a thorough inspection upon arrival to assess any repairs needed. We can offer services to repair damaged bearing surfaces as well as to repair Stainless Stellite helical rotor teeth. For Detachable Pelletizer and Wedgelock Pelletizer rotors we can replace broken or damaged blades and grind your pelletizer rotor back into prime condition. Our grinding equipment can grind up to 326 inches continuous which ensures your sets are ground to match better than OEM specifications, every time. We grind under full flood coolant to protect your knives so they don’t have their temper removed. This process leads to a longer life for your knives. Blades are given an initial visual inspection and cleaning to assess for any cracks or damage. We then grind the knives in sets and give a timely return to your facility whether it be on our delivery route or to ship via Freight of your choice. We offer the fastest turn-around time in the industry and we can accommodate rushes. 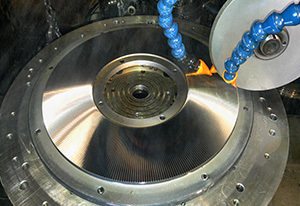 When it comes to pulverizer plates and pulverizer segments, after choosing the appropriate grinding wheel, our customized and individual setups leave you with a burr-free sharpness, providing a finished part with superior throughput. Whether you are using a standard single cut style or a double cut style, Midwest Knife is confident we can offer a quality, cost efficient sharpening with a reasonable lead time. And if an emergency strikes, we offer rush sharpening services. We will make your emergency our priority. 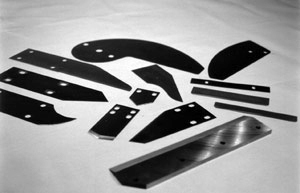 Midwest Knife Grinding, Inc. offers the highest quality replacement shear blades and rotary shears, with increased blade life and performance. High quality metal shears and shears on your slitting line are both essential to your operations. Most metal shear equipment makes are available from stock. Shears are manufactured to customer specifications with an honest lead time. High carbon, high chromium tool steel will provide maximum wear resistance for your lighter gauge shearing. 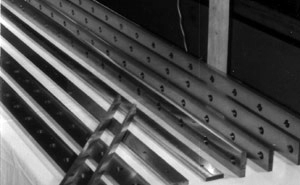 Wear resistance is of great importance for your long run production slitting as well. For heavier gauge shearing and slitting a shock resistant tool steel provides the added toughness required. We are simply the best value on sharpening. Most of our customers realize a minimum savings of 25% of sharpening service. When grinding your rotary shears and rubber stripper rings, our experienced technicians will take minimal removal to extend life of your blades. A precision matched set always guarantees your satisfaction. For metal shears we exceed A.N.S.I. specification by keeping a tolerance within .001 over a 250” length. Our state of the art grinding machines using a full flood coolant system keep your blades cool during grinding operations. 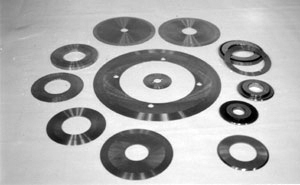 Our shear sharpening service includes re-sharpening all necessary edges, honing, demagnetizing, oiling and boxing. RUSH SERVICE IS ALSO AVAILABLE for our customers without a spare set. 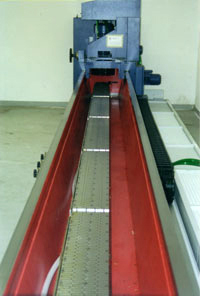 Midwest Knife Grinding, Inc. offers a wide variety of extrusion cutoff knives. We can manufacture from your sample or to individual specifications. Steel materials include blue tempered spring steel, M-2 Steel, D-2 Steel, A-2 Steel, stainless razor steel or tungsten carbide, depending on your application. Our unique sharpening and honing procedures will increase your number of cuts between blade changes. 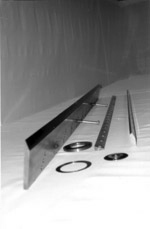 Midwest Knife Grinding, Inc. offers precision ground, wear resistant knives available from stock. Converting, printing, packaging and so many more industries can benefit from our quality products. We can meet your individual requirements on most specialty or custom needs. Our experienced staff will ensure your new and re-sharpened knives provide you with superior cutting performance. An experienced technician makes all the difference. At Midwest Knife grinding, we pride ourselves over our technicians expertise when it comes to grinding your paper knives. A keen eye and an experienced hand ensure your paper knives are so sharp they’re intimidating. Once sharp, paper shears are bolted to wood boards to assure safe handling. Whether your knives are Tool Steel, HSS Inlaid, or Carbide inlaid, we will make sure your knives perform phenomenally. Maintaining your shredder takes the right parts. At Midwest Knife Grinding we have the expertise to get you the right parts at the right time. We have concave and Raised Hub shredder blocks for many machine types. We also can supply bed knives, nibs inserts and the block holders for your Shredder. Whether you are shredding film or large purgings, we have parts to keep your machine shredding.